The Feb-11 issue of the Air Force Magazine discusses a recent wargame conducted at Schriever AFB. The US Military has problems defending space. This wargame highlighted that. I see two specific opportunities for New Space to help solve the US military’s problem . First a summary of the 2010 Schriever Cyber and Space wargame. A small US ally takes a “local action”, to which a US “peer” rival take offense (they went out of their way not to say “China”, instead “peer rival”, but I am going to say China so this post has a more conversational tone. To my friends in China, please do not take offense). Cyber war and Space war is instantly global – there is no easy way to keep these conflicts regional. Space Situational Awareness was significantly lacking. Military Takeaway #1: Create Joint-Sats. Group the capabilities of many nations/companies on a single satellite – this way an attacker would have to “ponder the fallout of collateral damage” prior to attacking a space asset. This idea may have some merit, but feels more like the military is hiding behind other nations and corporations. If the military was already worried about such cyber/space conflicts turning “global”, such joint ownership of future satellites will only exacerbate the problem of turning such conflicts into “global” ones. Military Takeaway #2: Enhance space situational awareness: develop a CSpOC – a Combined Space Operations Center to integrate the space data coming in from Government, Commercial, and foreign ally sources. I like this idea. This shows the military’s willingness to admit they will need the help of civilian and foreign sources to defend the cyber and space realms. However, can’t the JSpOC do this? I don’t know enough about the JSpOC, but since they already do so much space asset tracking, expanding the JSpOC’s capabilities may make more sense than adding a new group. But again, I fully admit I don’t know enough about this to recommend one way or another. So how can New Space Help? I will focus my comments now to the space domain. I see two major product/services that New Space could offer in the near term to help the military avoid the hypothetical results of the 2022 Schriever wargame. (1) NanoSat Launch Vehicles would offer the US the ability to quickly launch new satellites (100kg) to replace assets that are damaged or temporarily offline. The military’s wargame conclusions that by bundling satellite capabilities from several countries would deter an enemy, puts significant trust in your enemy not to come over the high wall you setup. But what if the enemy does escalate, what if they do attack those “joint-sats”? Such a policy does not solve the problem of a determined enemy. Being able to launch new satellites at will is perhaps the best defense to any anti-satellite weapon. I’m not the first to advocate this. I was just surprised by how little this solution was mentioned as a remedy for the US military’s poor performance in the wargame. I believe such an NLV is within the capabilities of new space (NASA’s NLV Challenge starts soon). If the NLV could launch on very short notice, there is no doubt in my mind that the military would be an eager customer. 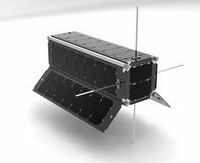 (2) OBSERVER CubeSat: Perhaps the best deterrence from a space attack is Space Situational Awareness. The US military is worried about how to “attribute actions” in space – basically answering the question, “who is shooting at me?” Here is one example, the military is worried about the idea of “grappler spacecraft” (among other ASATs) launched by peer adversaries months/years before a given conflict. When called into action the grapplers adjust their orbits (which have been benign up until now) and attach themselves to US military satellites disrupting their functionality. If the grapplers had been launched at the start of the conflict, figuring out who owns them would be fairly straight forward (thank you JSpOC). But if the grapplers had been launched months or years earlier, a small orbit adjustment just prior to attack may not be noticed by ground tracking stations making a surprise anonymous attack on US space assets a real possibility. **What the US needs is a way to view their own satellites in space. ** Can a cubesat (6U, 12U, or ESPA ring) fulfill such a mission? Can a New Space company build me an OBSERVER? Once the OBSERVER can service LEO customers, how about version 2.0 to service MEO, and GEO? The year is 2022, with OBSERVERs in place near all high value LEO military sats (now being launched on NanoSat Launchers), US adversaries know that any sneak attack in space using space assets would be caught on video. If an attack does occur, NLV’s can be launched quickly to temporarily replace lost US capabilities. The military can attribute actions and the effectiveness of ASAT weapons is severely hampered. Thanks New Space. New Venture Capital for New Space? Last week the White House began a push aimed at assisting entrepreneurs in high-growth industries. The Startup America Partnership seeks to connect entrepreneurs with the capital and expertise of large corporate/non-profit organizations - taking what works and doing more of it. I know Fred Wilson and other Tech Venture Capitalists are excited about this initiative from the President, but New Space should push to access these funds and expertise as well. Maybe I missed it, but I have not seen much New Space blog traffic about the President's announcment. Yesterday, Chuck Black spoke about the growth of the Venture Capital within NewSpace. Capital does not fix all problems within New Space, but access to more capital will surely help the industry grow faster. Through the Startup America Partnership, the President is targeting high growth businesses/industries. The Futron Corporation reported last week, commercial space is growing at 10% per year – 10% is high growth for an industry! I hope to see New Space firms in need of capital/expertise taking advantage of the opportunity. New Space is definitely a part of the Nation’s “solution for the future”.